Hailed as one of "Boston's best percussionists" by I Care if You Listen and "musical and deftly accomplished" by Gapplegate Classical-Modern Music Review, Matt Sharrock is a versatile marimbist, percussionist, and conductor who tirelessly champions the music of living composers. As half of the bass clarinet/marimba duo Transient Canvas, he has premiered over 80 pieces and tours extensively in the United States and abroad. He is also a founding member of the Boston Percussion Group and rides the line between rock band and new music ensemble as a member of the mixed quartet Hinge. As an orchestral percussionist, Matt has performed with some of New England’s finest ensembles, including the Boston Modern Orchestra Project, Portland Symphony Orchestra, Boston Landmarks Orchestra, and the New Hampshire Music Festival Orchestra. An advocate for new music, Matt currently serves as Music Director and conductor for Equilibrium, a new music sinfonietta dedicated to promoting the work of New England-based composers, and he is the resident percussionist with Ensemble / Parallax, a multimedia consort dedicated to the music of the European avant-garde. He has performed with many of Boston's premier chamber groups, including the Chameleon Arts Ensemble, Sound Icon, Boston Musica Viva, Alea III, the Lydian String Quartet, and the Lorelei Ensemble. Matt has recorded as a soloist, conductor, chamber musician, and orchestra musician on BMOP/sound, Innova, Navona, New Focus Recordings, and Ravello Records. A passionate educator, Matt is currently on faculty at the Boston Conservatory at Berklee in the music theory department in addition to teaching applied percussion at Bunker Hill Community College. He has presented his marimba masterclass Learning to Learn across the country at Rutgers University, the University of Georgia, University of the Pacific, and the Interlochen Arts Camp, among others. Dedicated to working with student composers, Transient Canvas was ensemble-in-residence with The Boston Conservatory High School Composition Intensive from 2013-17 and has held residencies with the composition departments at Harvard, Tufts, and Northeastern Universities, the Dancz Center for New Music at the University of Georgia, Vermont College of Fine Arts, the Boston Conservatory at Berklee, and the Alba Music Festival Composition Program in Alba, Italy. Matt holds an M.M. in Marimba Performance from The Boston Conservatory and a B.M. in Music Performance (Percussion) from Baldwin Wallace University. His primary teachers include Nancy Zeltsman and Jack Van Geem (marimba); Keith Aleo, Josh Ryan, and Sam Solomon (percussion); John Grimes (timpani), Sharan Leventhal (chamber music), and Dwight Oltman (conducting). Matt proudly endorses Marimba One marimbas, vibraphones, and mallets. For more information, visit www.mattsharrock.com. 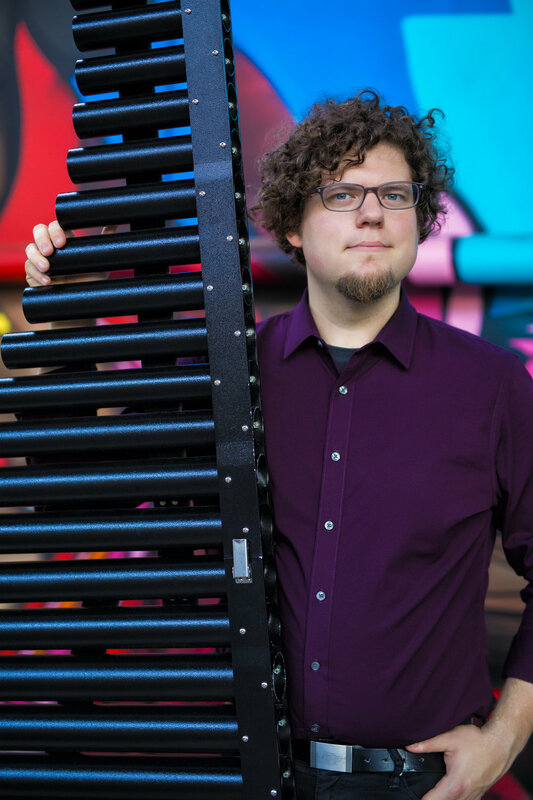 Hailed as one of “Boston’s best percussionists” by I Care if You Listen, Matt Sharrock is a versatile marimbist, percussionist, and conductor who tirelessly champions the music of living composers. As half of the bass clarinet/marimba duo Transient Canvas, he has premiered over 80 pieces and tours extensively in the United States and abroad. Since 2013, he has served as Music Director for Equilibrium and is a founding member of the Boston Percussion Group and the mixed quartet Hinge. Matt has performed with some of New England’s finest arts organizations, including Boston Modern Orchestra Project, the Portland Symphony Orchestra, Boston Landmarks Orchestra, the Lydian String Quartet, and the Chameleon Arts Ensemble. He can be heard on BMOP/sound, Innova, Navona, New Focus, and Ravello record labels. He is currently on faculty at the Boston Conservatory at Berklee in the music theory department and teaches applied percussion at Bunker Hill Community College. Matt proudly endorses Marimba One marimbas, vibraphones, and mallets. For more information, visit www.mattsharrock.com.